A piece of SHE ...: The Ruskin Bond Mini Bus. 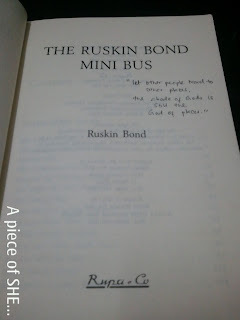 The Ruskin Bond Mini Bus. I had bid farewell to Mr. Ruskin many years ago. He was just a textbook author for me. I did not enjoy his writing during my school days. Those chapters were just like gateway for me to reach next standard in school. I was sure I would not pick his books in future. However, before leaving Kolkata, the sunshine man (my boyfriend. 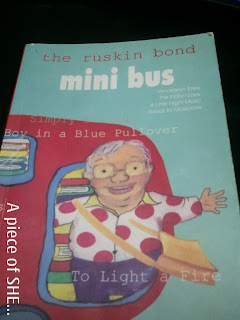 I will call him “the sunshine man” from now onwards in my blog posts) gave me “the Ruskin Bond Mini Bus” to read and my unexpected journey with the Ruskin Bond’s books started again. The sunshine man is an ardent fan of Ruskin Bond, so much that he does not mind calling him “Rusty”. Rusty is Bond’s nickname. This book is very close to his heart as it reminds him about his favorite place “Himalaya”. Ruskin’s books have encouraged the sunshine man to write poems and short stories since his childhood. Mini Bus is a collection of Ruskin Bond’s four famous books - Himalayan Tales, The India I Love, A Little Night Music, Roads to Mussoorie. As soon as I started reading it, I felt like packing my bags for a trip to northern part of India. If you are nature lover and if there is a child inside you still then this book is for you. A little night music is the compilation of his poems on children, nature, mountains, love etc. I have experienced all kind of emotions while reading this book. His description of North India would poke that traveler in you to come out. His writing style is simple just like him. Simplicity in his writing indicates two things: First, he writes books for young readers. Secondly, he is not writing to be “publisher friendly”. In mini bus, He writes about his childhood adventures, his life in Garhwal hills, which he calls his home, his life as a writer and many more essays, stories that are personal. I will read other books written by him. Next on my wish list is Flight of the pigeons. I am also currently reading Love in a torn land, written by the author of Princes and Mayada, Jean Sasson. It is a story about one woman’s daring escape from Iraq. My dream is under construction. I am not dreaming any dream; I am actually living my dream. Do not write me off yet, I still have a story to tell. Have you read any of Ruskin Bond’s books? What do you think about them or what are you reading now? Awesome post. I really enjoyed reading it. Thanks for sharing. Hope to read more. Shainee, I like "my dream is under construction" very much. You should see if you can get an image for it! Hope your week is going well. I've never heard of that author but those books definitely look interesting! Interesting. I'll have to check it out. And your one-liners are way better than what I could come up with. Thanks for following my blog, This Southern Girl's Life. I'm am now following! Ruskin bond is a great writer I always enjoy his writings till now ,A very nice post. nd i get it to read his books coz this give me pleasing experience and refresh my mood nd gv me encouragement nd to get prepare for another hectic day.....thanks shianee..